Support Nutrition offers you the supplement support you need for Heart and Cardiovascular health, healthy circulation and heart function. Women's Vitamins & Supplements provide the nutritional support women need for bone, heart health, Pregnancy, menstruation and growth. A majority of doctors recommend supplements and vitamins for their patients and multivitamins provide the essential minerals and vitamins. High potency, quality supplements insure our products are safe and effective. 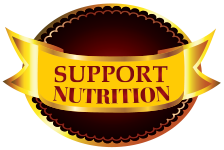 Support Nutrition Vitamins and Dietary Supplements are proudly made in the United States. Our rapid release softgels support antioxidant health. These dietary supplements are a powerful weapon in supporting general health and wellbeing.